The Russian Aerospace Forces aviation group in Syria. The Russian Aerospace Forces aviation group has attacked 118 terrorist sites in Syria over the past 24 hours, Russian Defense Ministry spokesman Maj. Gen. Igor Konashenkov revealed on Oct. 28. "The planes of the Russian aviation group in the Syrian Arab Republic have flown 71 combat missions against 118 terrorist sites in the provinces of Idlib, Homs, Hama, Aleppo, Damascus and Latakia over the past twenty-four hours," Konashenkov said. According to him, Sukhoi Su-24M bombers have destroyed a command post of militants and a large ammunition depot in the Syrian Latakia province. The unmanned aerial vehicles have spotted the command post of militants with a signal station and the large ammunition depot outside it in the area of the Salma settlement, the Latakia province. "After the additional reconnaissance of the target the Su-24M bombers have delivered an airstrike that destroyed the site completely," Konashenkov said. Meanwhile, the Russian Aerospace Forces aviation group has delivered strikes on the hidden terrorist bases in Syria, continued the combat mission to detect and destroy the convoys with weapons and ammunition, Konashenkov said. 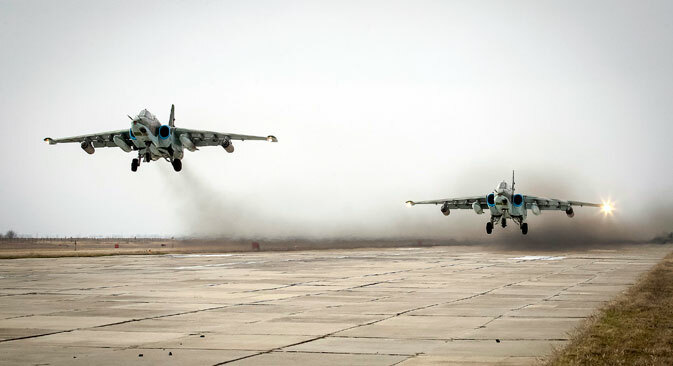 All Russian planes on the air base Hmeimim are fault-free and have enough munitions and fuel, Konashenkov added. He said the number of missions has increased due to an increase in the amount of reconnaissance information and the militants' terrorist infrastructure targets confirmed via various channels. "This fact is a convincing response to various depersonalized sources in some foreign mass media, which make unsubstantiated statements that our planes are allegedly faulty. I want to reiterate once again that the Russian planes on the air base Hmeimim are all-weather and all supply services of our aviation group are working in a coherent, reliable and efficient way," Konashenkov said. "Analyzing our foreign colleagues' methods used for working on this issue and anticipating their further misinformation, we report that we have enough physical resources, fuel and lubricants, munitions and everything necessary for effective military action," the general said.